Silver cast aluminum bracket for 1 in diameter flagpole. 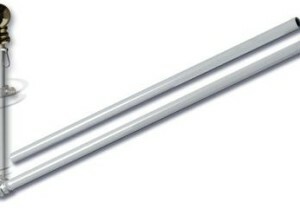 Holds flagpole at either a 45-degree angle or horizontally. 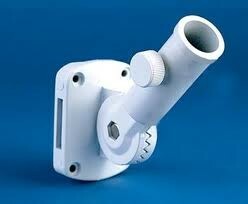 Includes thumbscrew to secure flagpole in bracket and three mounting screws. Ideal for decorative banners and vertical sports banner. 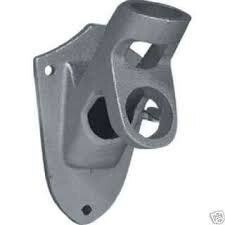 Cast aluminum bracket for 1 in diameter flagpole. White powder coat finish. Adjusts to 13 different positions, from straight up to straight down, including 45 degrees and horizontal. Useful if you sometimes fly a flag at 45-degrees and a decorative banner horizontally at other times. 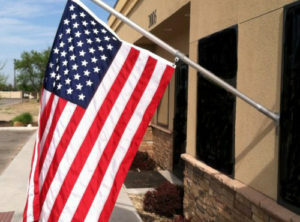 Great if you need to mount your flagpole at a special angle to fit under a gutter or to keep the flag from hitting hedges.